A new breed of cook has been causing a stir in the nation’s capital. These foodies may not have professional kitchens – or even certification – but Donna Henhoeffer thinks it’s about time we give them their due. The Taboo Eats founder launched My Neighbourhood Bites to showcase the city’s top amateur cooks. Over the next six months, 12 local neighbourhoods will take part, hosting cooking competitions from Vanier to Greely to Centretown. 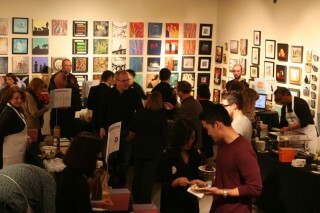 If the debut event at Cube Gallery is any indication (they packed nearly 175 guests into the Wellington West locale on Dec. 15), this project is shaping up to be a great success. Ottawa Magazine’s Erica Eades chats with Henhoeffer about her inspiration for the project, some exciting new partnerships, and how she plans to give back to the community. 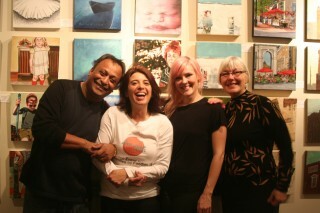 The top three winners of the first round of My Neighbourhood Bites join organizer Donna Henhoeffer (middle left) for a photo. So, tell us about your first event. It went really well! We had such a nice turnout, and it was a really good mix of people there – some who live and work in the area, others who came from as far as Orleans. What was the winning dish? The winning dish was the Mary Had a Little Lamb Meatball [created by Chantal Albert]. It was a Moroccan-inspired meatball that had a roasted eggplant and tomato puree, with a spiced toasted chickpea and a little bit of mint yogurt. How did this competition come about? I’ve been planning events for about 20 years and I ran a catering company for 10 years. In that time I saw cooks come and go and met with staff at all different levels. It got me thinking: How do I bring all that together and give people a chance to expose their work? You’ve been marketing My Neighbourhood Bites to “amateur cooks, home cooks, and oven-lovers.” Does this mean established cooks can’t participate? Not at all. Anyone can apply as long as they’re not a certified chef. A lot of the time cooks are recreating the same meals based off a menu; they don’t have the chance to be creative. So this is an outlet for them as well. How did you choose the different neighbourhoods? It’s not so much about the neighbourhood as it is the space. We really focused on finding venues that reflected each area. So far nine of the 12 areas have been announced. When will the final list be posted? Hopefully in the next few weeks. But if there’s someone out there who has a neighbourhood they think we haven’t represented, we’re happy to have them reach out to us! Guests mingle, eat, and enjoy the ambiance at My Neighbourhood Bites. The first of 12 rounds took place at Cube Gallery on Saturday. What can you tell us about your partnership with Winterlude? We’re hosting two events during Winterlude. One is being held at the Kichesippi Brewery and will focus on recipes that go well with beer. The other event will be a comfort-food-themed night during [Vanier’s] Winter Carnival. People will be coming to Winterlude from all over, so this is a great opportunity for cooks to get some exposure. You’ve also joined forces with several local food programs. That’s right. The top three entries from each neighbourhood will be published in a cookbook, which will then be sold in support of the Ottawa Food Bank. But in working with the food bank, we’ve also connected with groups in each of the neighbourhoods. For instance, with the Wellington West event, a coordinator from the Parkdale Food Centre came out to collect donations. What else should readers know about the competition? From my perspective, there are two messages with what we’re doing. One is to really rally local cooks and let them know that they should apply. You may be a bit nervous, but our team is really there to help with the whole process. The second thing is that it is a public event. We want the public to come out, to taste their way through, to connect with the cooks. And then to vote, because they’re the ones that make the final decision and determine who the winners are. Round two of My Neighbourhood Bites will take place at Centretown’s Babylon Nightclub on Jan. 12. Visit www.tabooeats.com for more information.